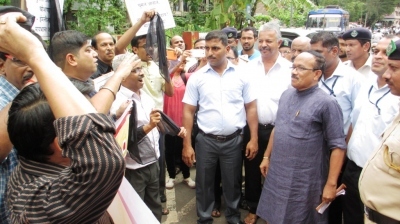 Chief Minister Laxmikant Parsekar today directly confronted the Bharatiya Bhasha Suraksha Manch demonstrators, most of whom were the RSS members, at Bicholim. The BBSM workers however told him firmly that they would not compromise on anything less than withdrawing grants to Church-run English primary schools. They also booed him since CM had earlier made a statement that the demonstrators had no principles on which they were protesting. It all started with around 50 demonstrators, led by RSS and BBSM activist Mahesh Mahambrey, shouting slogans outside the Bicholim Municipal hall, where CM was distributing LED bulbs. As the pace of slogans increased when he rose to speak, Parsekar said he is getting more energy to speak with people shouting slogans against him on the ground floor. He also advised the demonstrators through public address system that no issue can be resolved through demonstrations. He also reiterated that his government is committed to promote primary education in mother tongue while continuing grants to Church-run English primary schools is a technical issue. The CM once again made it clear that the government under no circumstances would withdraw grants to these schools, the prime demand of the BBSM. As Parsekar stepped down from the first floor, the demonstrators started shouting slogans more loudly. Parsekar went straight to them while the demonstrators became silent for a while. When CM asked them whether demonstration was over, Mahambrey told him that they will not keep quite till the grants are withdrawn. That will increase the standard of our education in Goa. Let us all contribute to such school were every student will speak all languages fluently and will automatically say BHARAT Mata ki jai. No SSC or ITI? No Govt service!